Patients arriving in the emergency room exhibiting signs of stroke such as numbness or weakness in the face, arm or leg, trouble speaking and walking or other symptoms, will have the Telerobot placed at the foot of their bed, so the physician has the ability to assess their condition and communicate treatment recommendations immediately. 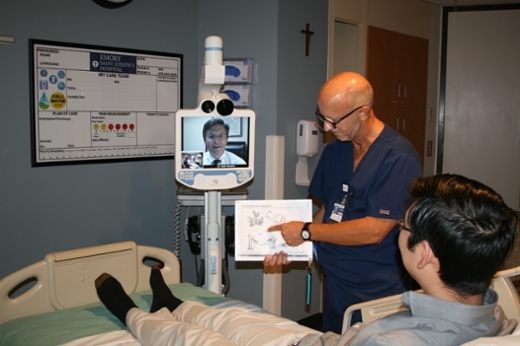 Emory Saint Joseph's Hospital is improving treatment for stroke patients with the launch of a Telestroke program, which allows neurologists to remotely evaluate patients around the clock through real-time conferencing with a Telerobot monitor. AcuteCare Telemedicine (ACT) and InTouch Health have partnered with Emory Saint Joseph's to bring these extended teleneurology services to the hospital. This virtual, high-tech clinical care includes a camera, microphone and speaker in order for the physicians to communicate directly with patients and provide a rapid diagnosis. The faster a patient receives the proper treatment for stroke, the better the chances for recovery. With this new telemedicine program at Emory Saint Joseph's, patients may avoid the debilitating effects of stroke that occur due to late diagnosis or delayed administration of clot-busting drugs. "The advancements in teleneurology not only allow us to access more patients in need of our specialized care, but improves patient outcomes overall," says Keith Sanders, MD, medical director of Emory Saint Joseph's Primary Stroke Center. "This new collaboration with Emory Saint Joseph's is sure to have a significant impact on the patients and communities we serve." Along with Sanders, fellow ACT physicians Matthews Gwynn, MD, Lisa Johnston, MD and James Kiely, MD are on-call 24/7 to work with the Primary Stroke Center Team at the hospital. During the evaluation, the physician asks the patients if they have had any difficulties with speaking and movement, and then encourages them to perform basic tasks, such as lifting their arms and legs and touching their fingers to their nose. Once the evaluation is complete, the physician makes a diagnosis and communicates treatment recommendations to emergency medicine doctors and the Primary Stroke team members. "Time is brain," says Regina Minter, RN, Quality Management Specialist for Emory Saint Joseph's Primary Stroke Center team, stressing the importance of a rapid stroke diagnosis and treatment. "The Telestroke program will enable us to give tPA in a quicker amount of time for the benefit of our patients," she says about the FDA-approved medicine that works by dissolving the clot and improving blood flow to the part of the brain being deprived. If administered within the first three hours, tPA may improve the chances of recovering from a stroke. Emory Saint Joseph's treats more than 400 stroke patients a year, and joins Emory Johns Creek Hospital as the second hospital within Emory Healthcare to offer the Telestroke program. Since 2009, Emory Saint Joseph's has been certified as a Primary Stroke Center, and is designed to provide emergent and acute stroke care. The multidisciplinary team includes ancillary, emergency and neurovascular services, a clinical decision unit, neurovascular units and a designated ICU. Emory Saint Joseph's has been recognized on the "Target: Stroke Honor Roll" by the American Heart Association/American Stroke Association (AHA/ASA), meaning 50 percent of ischemic stroke patients arriving at the hospital received tPA (door-to-needle time) within 60 minutes of arriving. The AHA/ASA also recognized Emory Saint Joseph's with the "Get with the Guidelines-Stroke" Gold Plus Quality Achievement Award for treating stroke patients with 85 percent or higher adherence to all "Get with the Guidelines-Stroke" achievement indicators for two or more consecutive 12-month periods. Stroke is the number five cause of death and a leading cause of adult disability in the United States, according to the American Heart Association/American Stroke Association. On average, someone suffers a stroke every 40 seconds; someone dies of a stroke every four minutes; and 795,000 people suffer a new or recurrent stroke each year. Since the inception of the Telestroke program at Emory Saint Joseph's, patients have already benefitted from the rapid response of the neurologist, which takes an average of four minutes. "The first day we launched the Telestroke program, a patient was admitted with acute symptoms of stroke. After careful assessment, we were able to administer tPA immediately with great success," Sanders says.